If you think macadamia nuts, avocados, lemons and vegetables produced by Wodonga Park Fruit & Nuts are healthier and taste better than the average, you're right. They're biodynamically grown, with no chemical contamination at any stage, from the soil right through to processing, farming practices incorporate natural fertilisers, bio-dynamic preparations and natural remedies to enhance product quality. We have dry roasted and salted, honey roasted and raw macadamia nuts in 150 gram packs or 10 kilogram bulk cartons. 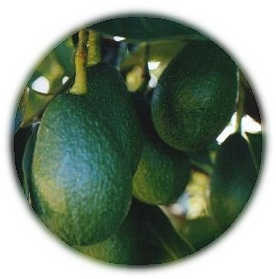 Avocados are available from August to December. Cold pressed extra virgin avocado and macadamia oil in 250ml & 500ml, 20L and 200L containers. Wodonga Park produce is healthier and tastes better. Macadamias are a high energy food and contain no cholesterol. The natural oils in macadamias contain 78% monounsaturated fats, the highest of any oil including olive oil. Research is showing that monounsaturated fats can assist in lowering blood cholesterol levels and reduce the incidence of heart disease. Macadamias are also a good source of protein, calcium, potassium and dietary fibre and are very low in sodium. Health Professionals say these are all important for good health and well being. Of the many benefits surrounding the Australian Macadamia nut, the greatest must be that something that tastes so good is actually very good for you. Eaten regularly and in moderation (6 - 20 nuts daily), macadamias can actively reduce the risk of heart disease. In clinical testing they have been shown to lower blood cholesterol levels by 7% in four weeks. The incidence of heart disease is significantly lower in people who eat nuts regularly. 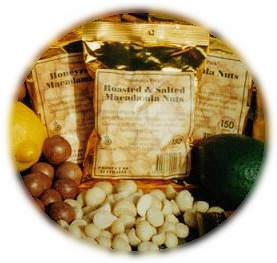 A high energy food, macadamias taste great eaten raw, and also enhance the flavour of cakes, confectionery, ice cream and casseroles - the possibilities are only limited by the imagination of the user. An annual residue testing program confirms the Wodonga Park Macadamias are Chemical Residue Free. The protein component of nuts is low in lysine and high in arginine. This low ratio is associated with lowering cholesterol, decreasing aggregation of platelets (thus reducing blood clotting and thrombosis), and improving relaxation of veins. The natural (raw) macadamias are now ready for packing. Ingredients: Organic (BD) certified raw macadamia nuts, organic certified honey, organic certified sugar, corn and/or flour, salt. Ingredients: Organic (BD) certified raw macadamia nuts, salt. Above relates to the edible portion only. Variety and seasonal conditions may cause minor variations in the above values.